Forget the oil industry's methane. Obama should crack down on cows. Forget the Oil Industry’s Methane. Obama Should Crack Down on Cows Instead. In the latest climate change executive action, the White House unveiled a plan on Wednesday to regulate methane for the first time, aiming to reduce emissions from the oil and gas industry by 40-45 percent on 2012 levels by 2025. 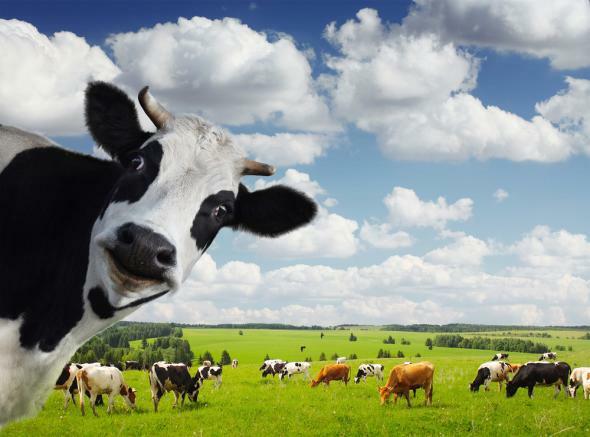 Methane is a big driver of global warming, second only to carbon dioxide. But the thing is, in the short term—and when talking about climate change, the short term is increasingly important as we blow through the carbon budget—methane is vastly more efficient at warming the planet. On a 20-year timescale, methane (which is the principal component of natural gas) has 86 times the global warming potential of CO2. That’s important, because on our current global emissions pathway, we only have about 27 years left before we lock in levels of warming that scientists and governments classify as “dangerous.” Simply put, cutting methane immediately is the biggest bang for our apocalypse-prevention buck. But Obama shouldn’t have started his war on methane with the oil and gas sector. The oil and gas industry is responsible for only 29 percent of U.S. methane emissions. And here’s the kicker: Obama’s proposed methane regulations only pertain to new oil and gas infrastructure. That means 90 percent of the industry in 2018 will carry on unchecked. If I’m doing my math right, less than 3 percent of U.S. methane emissions will be affected by the new regulations for the foreseeable future. With plunging oil prices bringing new drilling to a standstill and fresh research saying that the majority of fossil fuel reserves should stay in the ground, it’s increasingly indefensible that there should be any new oil and gas infrastructure at all. Plus, the oil and gas industry have a financial incentive to recoup lost methane anyway. I mean, that’s their job: capture and sell methane. Methane emissions from the industry are already in a downward trend. Agriculture, on the other hand, releases 34 percent of the country’s methane. Agricultural methane emissions, mostly from beef and dairy cattle belches and manure pits, have been stable or slightly increasing since 2005, despite U.S. greenhouse gases falling slightly over the same time period, mostly as a result of the financial crisis. In recent years, many a cli-fi novella has been written involving methane as a central plot device—there’s loads of it stored in melting Arctic permafrost and on frozen sea beds, enough to trigger unimaginable catastrophe should even a fraction make it to the atmosphere. Methane should worry us. I’m not saying methane regulations on the future oil and gas industry aren’t needed—I’m just saying regulations of current methane emissions are needed much more.